Buying a home in a resort market such as Big Bear can be exciting and lucrative. To find the right investment property that fits your personal needs, you need to partner with a local real estate pro that really knows the market and can help you find the perfect property. Work with Big Bear Real Estate and we will be able to find out what your goals are and help you reach them. Big Bear resort market real estate investing is our specialty! Following is information about what to expect when consulting with your Big Bear Real Estate agent about this exciting investment niche. As a resort market investors with over 20 properties ourselves, we are speaking from experience when we talk about investing. The Big Bear Real Estate team began their real estate careers as investors and business owners. We understand that your investment is also a business. We will do an in depth interview of what it is you want in your resort market second home. Once we have that information we will educate you on what criteria makes the most money in resort market transient rental. After an analysis of both sets of criteria, we will be able to focus only on the properties that make the most investment sense. Remember, even if you do not intend to place your property on a vacation rental program, your cabin’s value is tied into its income generation potential. Once you have found an investment property candidate, we will assist you in structuring the terms of your purchase to ensure that you are in a strong position. Terms are the negotiable aspects of the purchase and they include everything from the offer price, down payment, and interest rate to conveyances, occupancy, and closing costs. Contract terms are how you can maximize the financial value of your investment. Any real estate investment that relies on income generation requires a network to ensure success. We can show you what that network looks like, from housekeeping and maintenance to marketing and technology. You will get an up close and personal look at how a high functioning vacation rental management company operates. At your request, we will tour the Big Bear Vacations office so you can see the operation in action. We will schedule and appointment with our program property manager, who will give you the breakdown on how to get started and answer any questions you may have. The numbers matter when income generation is part of the investment. While no one can ever guarantee specific income generation, we can provide comparable income producing properties and detailed information on how to maximize potential. Big Bear Vacations will support you and we will educate you on what choices you can make to maximize your success. There are many ways to undermine or enhance income generation and we will make sure you are aware of these things. We understand there can be a considerable expense involved in looking for real estate in Big Bear. Whenever possible, we may personally provide accommodations for you and your family while looking for your investment property. An analysis of where you are in the process of your resort market purchase and the date of your visit must be taken into consideration. We believe it is important for an investor to live the vacation rental experience from the renters point of view, so you can set up reasonable expectations for your investment venture. Many investors in Big Bear have more than one income generating property. We will stay in constant communication with you to keep opportunities flowing your way. Whether you want to add more than one property to your investment portfolio or you want to upgrade every few years until you are in that beautiful lakefront you have always dreamed of. Whatever your vision, we will help you realize your dreams. Face to face access to 50 – 60,000 guests who stay with Big Bear Vacations annually makes target marketing your investment a special and unique experience when you list with us. We have aggressive and creative ways to market your home when you’re ready to sell. 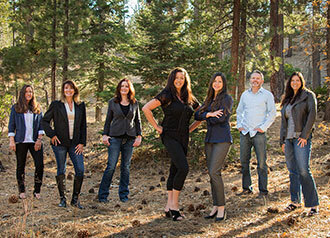 No other real estate company in Big Bear has access to so many potential buyers.